Chef Cat Cora joined the ladies for THE TALK Food Festival. 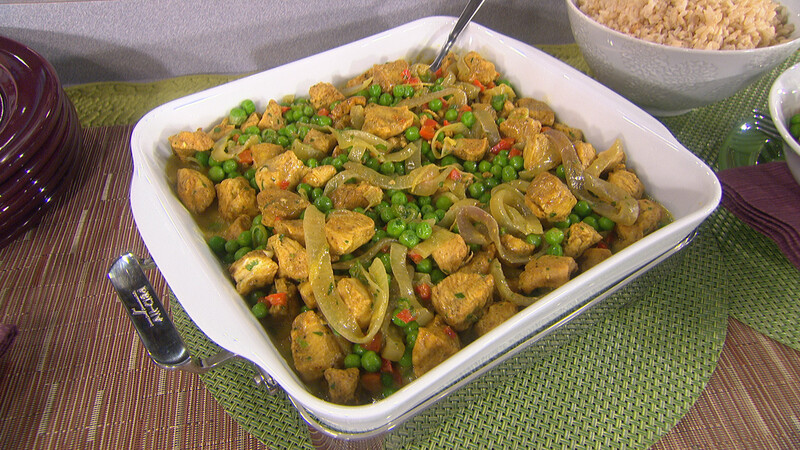 She cooked up an easy and delicious meal you could make for dinner tonight! Here are her recipes. Cut the chicken breasts into 1-inch pieces. Sprinkle with the salt, pepper, and curry powder. Cover and refrigerate for at least 1 hour or overnight. Heat the olive oil in a large skillet over high heat. When the oil is hot, carefully add half the chicken pieces and half the diced red pepper. Cook, stirring occasionally, until the chicken is lightly browned on all sides, about 5 minutes. Transfer the chicken and red pepper to a plate, drizzle more oil into the pan if necessary, and cook the remaining chicken and diced pepper, transferring it to the plate with the first batch. Add a little more oil to the pan if necessary and add the garlic and the onions. Cook, stirring, until both are lightly browned, about 4 minutes. Return the chicken and red pepper to the pan, along with any juices on the plate. Stir in the coconut milk and the water. When it simmers, reduce the heat, cover, and cook for 20 minutes; stir in more water, ¼ cup at a time, if the sauce becomes too thick, letting the sauce cook for a few minutes before adding more. When the chicken is tender and the sauce is velvety, toss in the peas, scallions, and cilantro, stir once or twice, and serve. to test for doneness, but don’t stir or move the rice. Fill a large pot or bowl with ice and water. For the Vinaigrette: Whisk together the mustard and vinegar in a small bowl. Slowly drizzle in the oils, one at a time, whisking constantly, until the vinaigrette is thick and creamy. Add the salt and pepper and set aside. (The vinaigrette can be made 1 to 2 days ahead and kept, covered, at room temperature. To Blanch the Vegetables: Using a fine-mesh basket or a slotted spoon, dip the carrots in a large saucepan of boiling salted water for 2 to 3 minutes, removing them while they’re still crisp and bright. Cool them in the ice bath, then scoop them out, let them drain for a few seconds, and place in a large bowl. Add more ice to your ice bath and repeat the blanching process with the green beans, transferring them to the ice bath while they’re still bright green, cooling and draining them in the same manner and adding them to the bowl with the carrots. For the Salad: Add the onion, corn, celery, and artichokes to the bowl. Just before you’re ready to serve, add the avocados and the tomato. Gently toss the vegetables with about half the vinaigrette until they’re lightly coated. Season to taste with the salt and pepper. Sprinkle with the grated cheese and gently toss once more. Toss the greens with the remaining vinaigrette, but use a light hand. Taste the salad and add more salt and pepper if necessary. Divide the salad greens among four salad plates. Mound the chopped vegetables on the greens and serve. Cat’s Note: If your corn is not very fresh, cook the husked ears in a large pot of boiling salted water just until tender, about 3 minutes. Remove with tongs and cool before slicing off the kernels. (You don’t need to cook very fresh corn.) Either way, use a sharp chef ’s knife to slice the corn kernels off the cob, hugging the cob with the knife as much as you can. Stand the ear on a cutting board, holding the top with your hand. 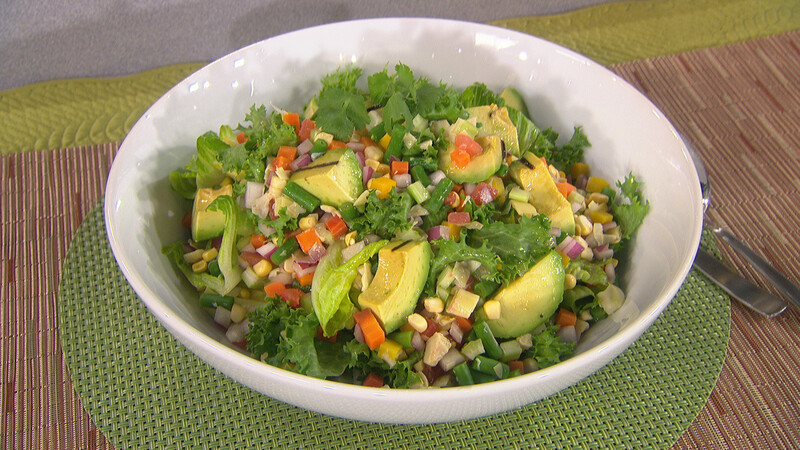 You can also add grilled avocado to this dish for little extra flavor! In a blender, puree the grapefruit chunks. Pour in the remaining ingredients, and blend until smooth. 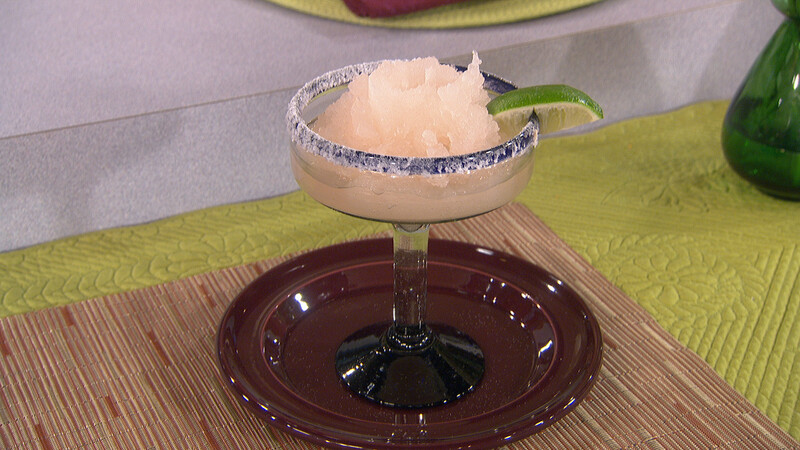 Run a lime wedge over the rim of each glass and dip in superfine sugar. Carefully divide the margarita mixture among four glasses and serve.